One of Jaina's loot drops significantly reduces the difficulty of a fight mechanic — but should it? NEXT | What game haven't you tried yet? In the Battle of Dazar’alor raid, one of the loot rewards from the Jaina fight has an interesting effect on it. The item is Fogbreaker, Light of the Sea, an off-hand piece of gear that includes an equip effect for a particular mechanic of the fight. For those who haven’t seen much of Jaina — or didn’t watch the world first kill of Mythic Jaina yesterday morning — the fight starts out on the Zandalari ship and then ends in the middle of the ocean. Jaina lures the Horde out to sea in order to fight in a territory she can directly control with her Mage powers. In the transition from the ship to the frozen surface of the water, players must search through the fog to find where Jaina is located, very much like the intermission with Illidan during the Kil’jaeden fight in Tomb of Sargeras. The off-hand comes into play because it lessens the effects of the fog (Howling Winds), which makes it easier and quicker to find Jaina to continue the fight. 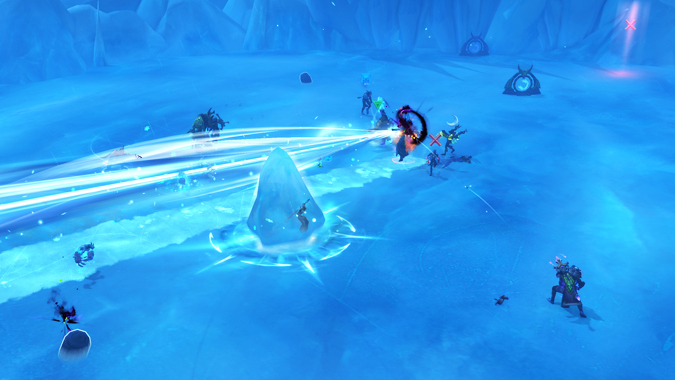 As a result, the raid will also accumulate fewer stacks of Chilling Touch and reduce the possibility of being hit by Glacial Shards and getting Frozen Solid. The item’s effect is a personal effect, according to the comments on Wowhead, so only the player with the item receives the increased visibility. However, this is no different than players who used their personal Track Humanoids ability to point out Illidan to their raid team — it still helps the raid group progress through the fight faster overall. In a way, it acts as an inherent nerf to the fight after you’ve already proven yourself capable of beating it. Of course, it could also act as a pre-nerf if you’re lucky enough to get the item in a lower difficulty before progressing at the higher one. If it’s really useful, we may see guilds continue to farm Jaina in Normal and Heroic modes while they progress through Heroic and Mythic. If so, it keeps players busy since there’s no skip (for now) and they have to clear the whole raid to get to her. In a sneaky way, that also extends the life of the raid when players feel compelled to keep playing through it rather than moving on. It’s a neat thing to add to the fight, and it’s not the only bonus effect from loot in the raid. But while other items have more generalized effects, this one directly impacts progress on the fight. I’m of two minds about it, mostly because the strength of the effect can make or break it. Being underpowered makes it easily ignored and simply for a little flavor, while being overpowered makes it a necessary item for every caster. It also creates even more farming if you don’t have a main-hand weapon to go with it. What do you think about acquiring items that help you negate fight mechanics?